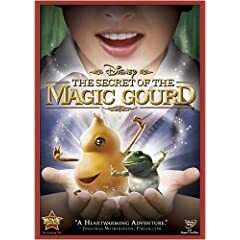 BURBANK, California, October 31, 2008 – The wonders of childhood come alive in The Secret of the Magic Gourd, coming to DVD on January 27, 2009 from Buena Vista Home Entertainment, Inc., perfectly timed with the Chinese New Year. Featuring the voice of High School Musical’s Corbin Bleu as the title character, The Secret of the Magic Gourd is brimming with original bonus material, including exclusive behind-the-scenes footage, bloopers and a brand new game, making it a must-own family film. One of China’s top grossing family films and Disney’s first Chinese language film, The Secret of the Magic Gourd will appeal to the world over with its heartwarming, fun-filled adventures and universal themes of perseverance and self-reliance. Based on the beloved Chinese children’s novel, The Secret of the Magic Gourd tells the timeless story of a boy’s coming of age using a dazzling combination of live action, CGI animation and spectacular special effects. In addition to the English soundtrack, Mandarin and Cantonese soundtracks are also available on the same DVD. The Secret of the Magic Gourd is the story of Raymond, a young daydreamer whose vivid imagination has made him an outcast at school. On a solo fishing trip, Raymond reels in the mysterious Magic Gourd, who offers to make all his wishes come true. When each of Raymond’s seemingly simple wishes backfires, creating unintentionally hilarious consequences for the boy, he realizes that “there’s no such thing as an unearned reward,” but with a little hard work, he can create his own kind of magic and achieve his dreams.